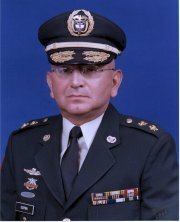 General Ospina was born in Manizales, Department of Caldas, on February 25, 1947. He entered the Military School for Cadets at the age of 17. An infantry officer, General Ospina has completed the Colombian Army courses in Military Parachuting, Special forces, and Counterguerilla Operations. In the United states, he has completed the U.S. Army Airborne Basic Course and Advanced Infantry Officer Course, Fort Benning, Georgia; he is a graduate of National Defense University, Fort McNair, D.C.
As an instructor, his assignments have included positions as professor of Military History at the Military School of Cadets, Instructor for the Lancero (Ranger) course, and as a guest instructor at the War Academy of the Chilean Army and the U.S. Army School of the Americas. He has commanded the 33rd Infantry Battalion, 13th Military Police Battalion, The School of Lanceros (Rangers), the 2nd Mobile Brigade, the Fourth Army Brigade, and the 4th Army Division. He has also served as Army Chief of Operations (E-3) and Inspector General of Military Forces. Following his designation as the next Commander of the Army by President Uribe, he was sworn in on August 15th, 2002.